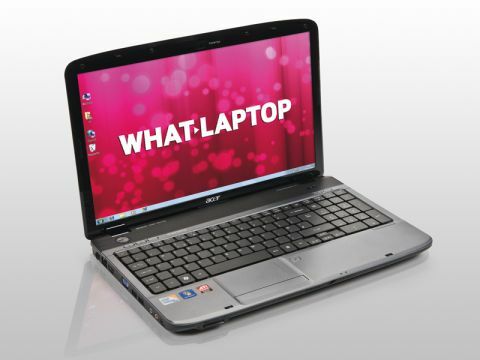 The Acer Aspire 5738PG-644G32Mn is a laptop that boasts touchscreen capabilities designed to enhance the user experience. We were initially sceptical at how intuitive the screen would prove, but were quickly won over. Elsewhere, this machine is well built, comfortable to use and provides good all round performance for the price. The 15.6-inch screen features touch functionality and is designed to make using the laptop as intuitive as possible. Acer has succeeded admirably in implementing this with the Windows 7 operating system and, while it's obviously early days for the technology on laptops – rather than Tablet PCs – this machine is certainly a step in the right direction. Getting started is as simple as calibrating the screen. You then navigate your way through the operating system using only your fingers – we found it far quicker than using the touchpad and mouse buttons. To demonstrate the technology and provide you with a media centre, Acer's Touch Portal software is included and lets you browse and select your music, movie and photo libraries using touch functionality – this all works well. We found the touch functionality most successful when using Windows Internet Explorer and surfing the web was quick and extremely intuitive. The only major downside is the shiny Super-TFT screen coating in place, which quickly gets covered in distracting fingerprints. As we've come to expect from Acer, build quality is very good, with firm plastics providing the machine with excellent durability. The keyboard is also decent, although it's very flat and occasionally easy to get lost on when typing at speed. The Intel Core 2 Duo processor is combined with 4096MB of memory to provide fast everyday performance and you'll have no problem running office applications or the touch software. The inclusion of a dedicated ATi graphics card also means this machine is suited to multimedia work and, even though the latest games will struggle, photo and movie editing won't be a problem. Portability is good and we managed to squeeze a more than satisfactory 250 minutes from the battery. The 2.8kg weight won't prove an issue for regular travelling. 802.11n Wi-Fi and Gigabit Ethernet provide the latest networking technologies. There are also four USB ports, as well as VGA and HDMI out ports. We like the Acer Aspire 5738PG- 644G32Mn a lot and while, realistically, you'll be using the keyboard and touchpad as much as you did before, the touch screen technology is well implemented and very intuitive to use.